This weekend marked the 17th annual SonRise pageant put on by Southern Adventist University. It's a dramatic presentation of the last week of Christ's life here on earth, starting with His triumphal entry and ending with His resurrection. This year, I acted as one of the thieves hanging with Jesus on the cross. The whole experience was incredibly impacting, and I will never forget the lessons I learned that day. As part of the crucifixion scene, we had been rehearsing for weeks before the pageant. Us thieves would practice our lines, the soldiers would practice hanging Jesus on the cross, the priests would practice their mocking sneers. But the whole experience never really hit me until the day of SonRise. Robby and I, the two thieves, were already hanging on the cross when the huge crowd of people started migrating around the gym, bringing Jesus from Pilate's Judgement hall. Over the loudspeakers the Via Dolorosa song began to play as the group drew nearer. The banners were flying, the soldiers were marching, and then, in the center of the mocking crowd and boisterous Romans, was Jesus. I knew Roy, the actor portraying Jesus, and was anxious to see how well he did playing the part. But I never saw Roy. All I saw was a bruised and batters Savior, coming to hang on a cross and endure unspeakable torture, for me. It froze me. If anyone wonders why one of the thieves was crying the first time Jesus was brought to Golgotha, they now know why. It became so real. I will never forget the audience member crying her eyes out as she watched Jesus be crucified. At one point a girl was sobbing uncontrollably while her boyfriend tried to console her by telling her it was just a play. But it wasn't just a play. It really happened. 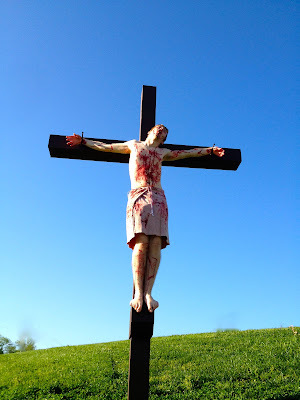 There was a real Jesus with real feelings Who was crucified on a real cross. It's good to read about it, it's powerful to contemplate it, but it's life changing to witness it. The most exciting part of SonRise, however, is the very end, when Jesus raises back to life. The sorrow at His loss is felt, the intensity of the battle between the powers of darkness and the angels of light is witnessed, and then, as the song "Arise My Love" is played, Jesus comes forth from the grave to conquer sin and Satan once and for all. With all the pyrotechnics flashing and sound effects shaking the auditorium, the emotional impact was incredible. Oh that I could have been there on that day. To realize just how much Jesus went through to save each and every one of us - you, me. Then to witness Him rising from the grave. 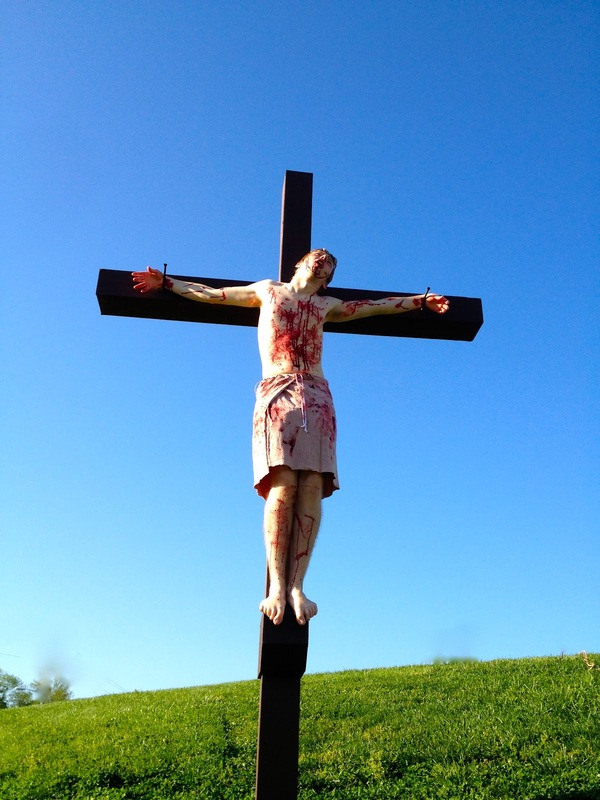 I pray you, as well, spent this Easter holiday contemplating Christ's great sacrifice for you. And I hope it changed your life like it did mine. One of my friends, Stefan Heldzinger, on the right, with more soldiers in the background. Practicing lowering Jesus off the cross. Tough guys these were - every chance they got they were resting. Thank you for sharing Seth. God bless you brother!